last week mr. arganbright cleared out this strange space in our hallway. 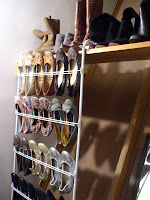 i turned it into a makeshift shoe closet! complete with bare-bulb lighting, nasty green carpet, and a mirror!!! judge all you want, at least now they're organized. Fabulous! When do you get your walk in closet downstairs??? Your hubby is so good to you! i've kinda nixed the "dressing room" idea. i can just imagine piles of clothes lying about our room because i'm too lazy to walk downstairs at the end of the day, y'know? 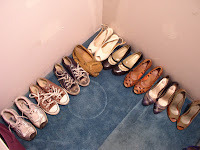 so for now, everything's still unorganized--except my shoes!!! love it! nice job. looks like you could still get a couple cheap stacking plastic shoe racks for the shoes on the floor...might free up some more floor space for who knows what! for more shoes of course!! ha.